Welcome to Garden City Children’s Center! Garden City Children’s Center was founded by an enthusiastic educator who realized that there was a need for quality care in a child centered environment. Garden City Children’s Center takes great pride in being a smaller child care center. We take every advantage to get to know our families on a personal level. We maintain an open line of communication with our parents concerning the individual needs and progress of the child. We strongly encourage and welcome parents to participate in our program through sharing skills and services and by offering opportunities to spend time participating with the children in their day to day activities. Garden City Children’s Center is licensed to accept infants, toddlers and preschoolers and welcomes any opportunity to share and show new families the place where children love to play and learn. Please contact us anytime to arrange a tour of our classrooms. Our goal at Garden City Children’s Center is to provide a learning environment that enhances the “whole child’s” individual learning styles and to offer it all in a family centered environment. A carefully planned curriculum is designed to foster each child’s developmental pace as he/she explores their surroundings. Children are encouraged to move from one activity to another throughout the day. Activity areas may be setup to allow children to play with others or to work alone should they choose to do so. Our teachers encourage the children to use their own ideas and individuality as they work and play. The overall goal is for each child to develop friendships, a sense of security in themselves and their surroundings when away from home and to develop all the necessary skills need to continue to grow and learn. 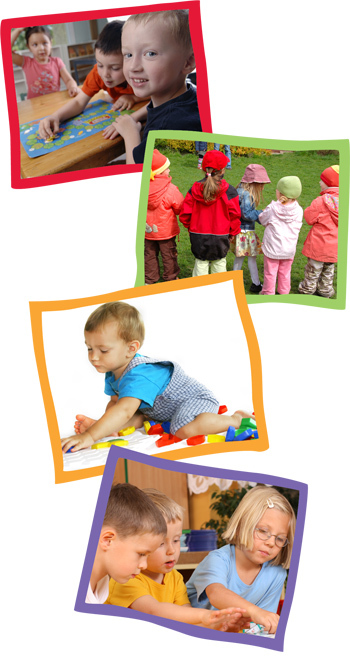 All of these are accomplished in a creatively well designed “play to learn” environment.